2000 Have We Made Progress Today? 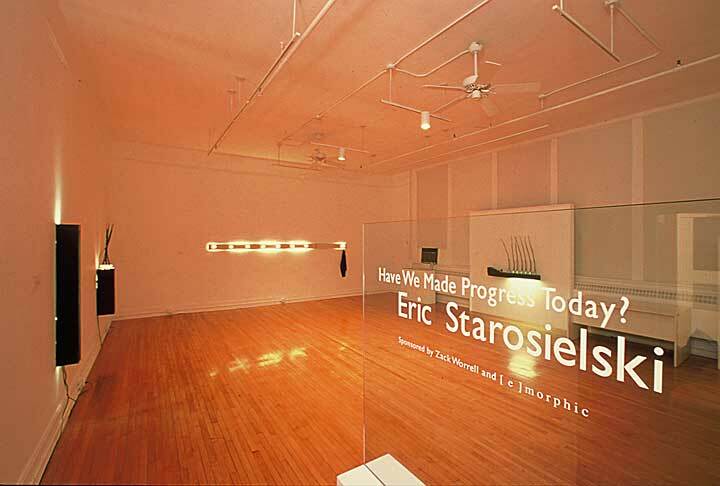 Work involving light, sound, and participation in daily life. The first seven images photographed in Boston and NYC by, Chelynn Tetrault of the artist brushing his teeth in business environments. 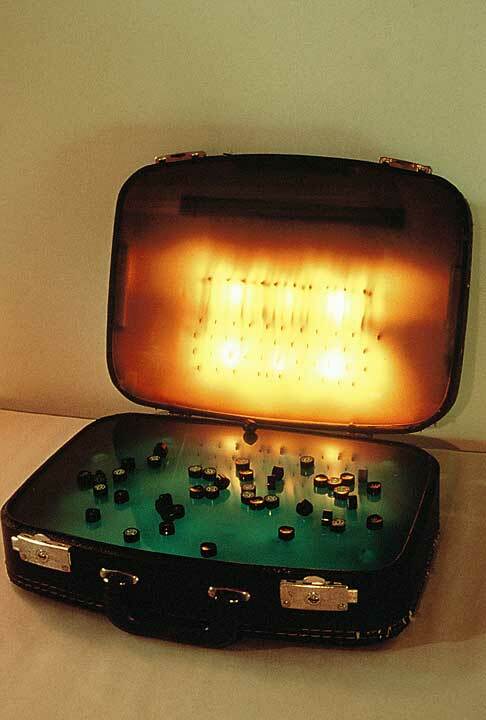 A series of slides taken from above the artist's former girlfriend’s bed and his bed for 30 days. Each image was taken at 3:01 am simultaneously from two separate cameras mounted above the beds attached to timers, automated to trigger at the same time in two different locations. After 30 days, the 35mm film was processed uncut producing a linear documentation of this time period. Standard motion changes light sequences 4 times, in 3 minutes. Two of the sequences are on only 8 seconds, while the others stay illuminated in the space for longer segments of time. This cycle is repeated continuously. 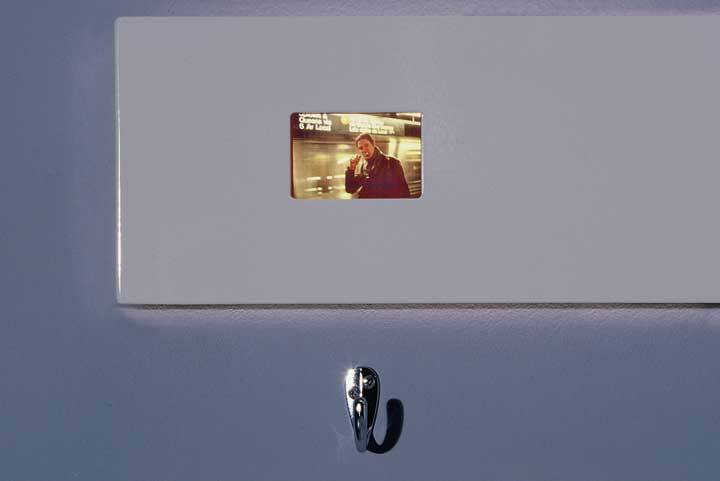 One of the main pieces in this exhibition Priorities, 2000 in which the artist presents narrative back-lit photo images of the artist's brushing his teeth in public places on the go, such as business environments in Boston and New York. Each image is framed in a continuous 96-inch aluminum channel; below each image is an empty coat hook. In a separate 40-inch channel are the last two images from another piece 3:01am & 30 Days, 2000 with two images of beds of the artist and another of his former girlfriend. 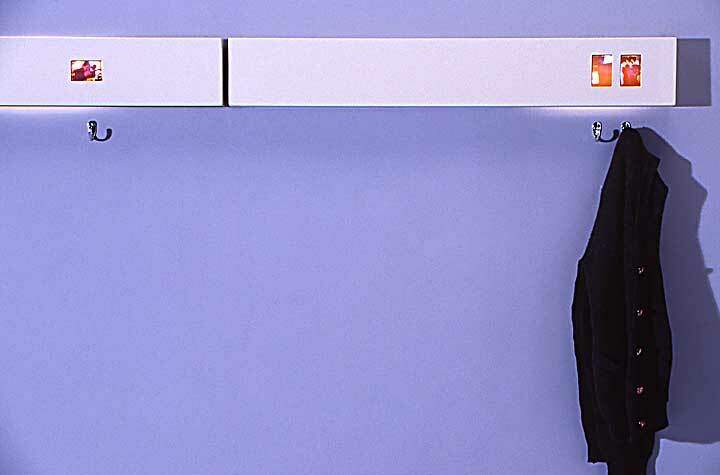 A sweater hangs below on the coat hook where the artist is sleeping. Humanity is always trying to progress: there are so many people calling on the cell phone, big business lifestyle work, work, work… and we leave loved ones and family as a last priority. 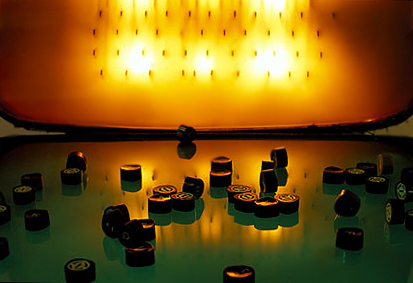 3:01am & 30 Days, is a piece that encases a series of 35mm slides taken from above the artist's former girlfriend’s bed and his bed for 30 days. Each image was taken at 3:01 am simultaneously from two separate cameras mounted above the beds attached to timers, automated to trigger at the same time in two different locations. After the 30 days, the 35mm film was processed uncut to produce a linear documentation of this time. It reveals the lifestyle of the unmarried professional; packing the overnight bag, night after night and running to the lover's house, leaving behind the comforts of one's home and objects of nostalgia, for another comfort.